Hedrick Smith Can You Afford To Retire? Evaluating the impact of the economic meltdown and financial turmoil – with experts’ analysis and articles on what’s gone wrong and what’s ahead. Frequently Asked Questions about pensions, 401(k)s and how much to save for retirement. 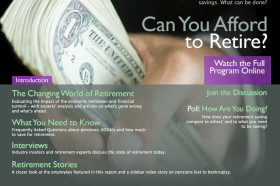 Industry insiders and retirement experts discuss the state of retirement today. A closer look at the employees featured in this report and a sidebar video story on pensions lost to bankruptcy.